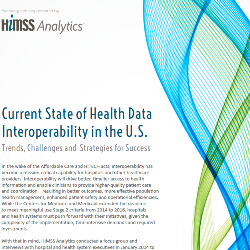 HIMSS Analytics Report: Current State of Health Data InteroperabilityInteroperability refers to the ability of two or more systems or components to exchange information and to use the information that has been exchanged. in the U.S.
Corepoint Health Commissioned HIMSS Analytics to conduct an independent focus group of health IT executives to provide a snapshot of current strategies, successes, and challenges affecting the industry today. Focus group participants represented hospitals ranging in size from 275 beds to 722 beds. Key findings in the report include frustrations over the readiness of external data exchange partners, including health information exchange (HIEHealth Information Exchange (HIE) focuses on the mobilization of healthcare information electronically across organizations within a region or community. HIE provides the capability to electronically move clinical information between disparate health...) organizations and other provider organizations. To overcome interoperability challenges, many hospital executives in the focus group said they are creating their own private, or enterprise-level, HIE to create interoperability among their business partners. Private HIEs are becoming more valuable as their healthcare systems are expanding in size due to mergers and acquisitions of community hospitals.